Optimus Prime has long believed that freedom is the right of all sentient beings. He has never wavered from this belief, no matter what has befallen him in battle. Once again ready to defend the people of his adopted planet, the unyielding Autobot commander prepares for the battle that will allow the Autobots to reclaim their role as Earth’s honored protectors. Optimus Prime has had many alternate modes throughout his 30 years – fire engine, gorilla, lion, military space truck etc – but none more iconic than a truck cab. 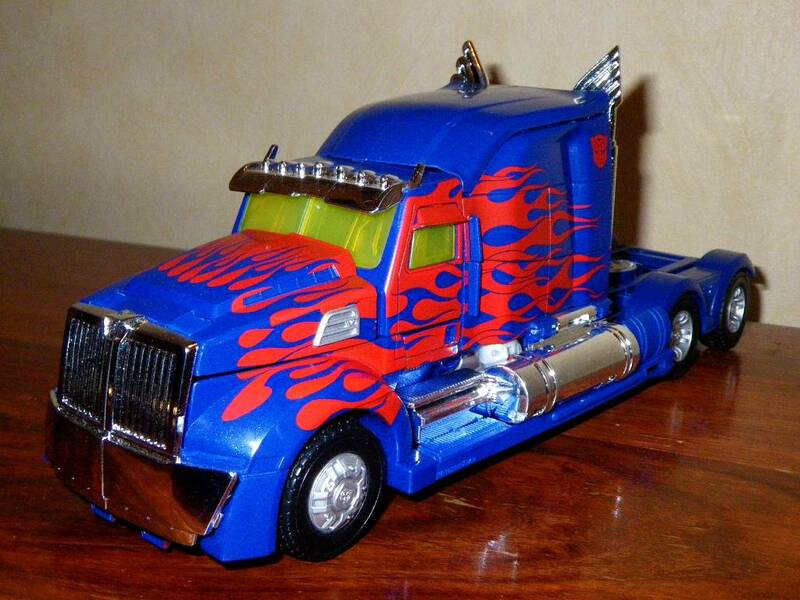 Of course, his original G1 design had him transforming into a red and blue Kenworth K100 cabover truck, whereas Michael Bay updated him to be a Peterbilt 379 which was largely blue with flame detail for the first three live action films. In Age of Extinction (AoE), Optimus Prime has two ‘disguises’, both of which are again trucks. We initially find him in hiding, as a Marmon Co” Heavy Duty Cabover with sleeper – his ‘Evasion Mode’ and a wonderful homage to his G1 design. In fact, the standard version of his Voyager Class toy even has a G1 paint scheme (both Takara and Hasbro versions, although the latter is rather light on paint applications), although he appears as a rusty brown with hints of flame details in the film itself (afraid you need to look for Hasbro or Takara exclusives for that deco). Later in the film, as he comes out of hiding and moves on the offensive to deal with humans who are killing and melting down Autobots to build their own Transformers, Optimus Prime updates his alternate mode and becomes a 2014 Western Star 5700 Concept truck. This is a far slicker and ultra-modern look, and is once again largely blue and adorned by flame detail. Like many of his Autobot companions over the four live-action movie films, Optimus Prime finally has graduated to the ranks of swish supercool concept vehicle alternate mode. The truck measures 10” (25.5cm) long, which is 1” shorter than ROTF Prime’s Peterbilt mode. Unfortunately, I’ve not been able to find dimensions on the real truck, so can’t estimate scale. The truck mode does look awesome – it is largely cast in metallic blue with pale blue metallic flakes, although the fuel tanks, visor, grill and smokestacks are all chromed, while the rear of the cab is cast in proper silver plastic. The windows are a fairly horrible transparent yellow for some reason though, but fortunately they’re not very big and so it doesn’t detract too much. The wheels are proper silver plastic, while the tyres are rubber (!). There are blue flames on the front, over red, which itself becomes a second wave of flames. While these are not pinstriped with blue as in the film, they do have unpainted outlines in the dark blue of the plastic, which is neat. Similarly, the door and panel lines are picked out in the same way on the red sections. The Takara version does not look dramatically different from the Hasbro one in this mode, but one key difference is in the flames – the blue is shorter on the nose, and the red flames are more extensive. This is a better match for the movie truck deco than the Hasbro version. Sadly the flames do not extend to the first pair of rear wheel ridges. Silver paint picks out the vents on the side of the nose, as well as the rear cupola, and tail light area. Sadly no lights are painted themselves on the front or rear. The moulded detail is great, including an Autobot insignia on the front grill, Western Star insignia on the sides towards the rear, ‘Western Star’ in tiny moulded text just behind the front wheels, and Autobot insignias on all wheels. There is also a non-moulded, red painted Autobot insignia on the left side of the cab. The rear of the truck, where a trailer would attach, is oddly holly with many gaps. Real truck cabs are pretty stripped down at the back to reduce weight, but I’ve never seen one with huge gaps like this. However, I don’t know what the Western Star 5700 will be like (although I doubt it’s quite like this!). All-in-all though, the truck mode is fantastic, and holds together extremely well (it ought to being largely a shell!). The whole effect with three curvy smokestacks on each side and flame detailing evokes a weird Optimus-Rodimus Prime hybrid for me in this mode. In terms of storage for accessories, the sword can be kept underneath the truck. Sadly, the shield can only be stored in full view attaching to the cupola. Optimus Prime’s new robot mode is super-stylised, with lots of curvy mechanical details. It’s also largely silver, with some blue and only very little red. So, this was always going to be something of a shellformer. I suppose what’s amazing is he’s not more of one than he is. That being said, there are truck parts on the chest, legs, shoulders, hips and back in the CGI model. This is true of this Leader Class toy, although the chest is false (probably the best option, but I’d have loved to see the actual truck parts there), while the wrong truck parts make the shoulder pads and hip flaps. While this could be acceptable, the problem is that the CGI model hips are plain blue, whereas the shoulder pads have red flames. As the shoulder pads are made from the roof on the toy, and the hip flaps the truck sides, the pattern is vice versa on the figure. Had the robot mode head been underneath the truck, rather than under the roof, the correct arrangement could have been achieved with minimal change to the design. To address the elephant in the room upfront, the entire rear of the truck does just hang off Optimus Prime’s back, jutting above his head, and cannot be further folded away. The photos do not lie. This destroys his silhouette completely, and lessens the effect of the smokestacks. Also, what is not obvious from photos is that the hip flaps are actually attached to this backpack and not the waist, leading to serious limitations to range of motion despite excellent articulation. Moving on, the rest of the figure is actually really cool in robot mode. It is, of course, in this mode that the Takara and Hasbro versions seriously diverge in quality. Takara have given the superdetailed mould such a premium level lavish paint job (ironically better than the Hasbro Platinum premium version of the First Edition Leader mould!) that he still looks beautiful on display despite the kibble. Optimus Prime’s new robot mode is sleeker and more curvy than his previous movie incarnations (even compared with his ‘Evasion’ form earlier in the film). It obviously takes a lot of its design from Eastern cultural references, compared with the more traditionally bulky robot alpha-male build of the original three films. The bulk of the robot mode is either cast or painted a white gold / platinum / silver colour with an extremely high-end finish. The chest has metallic blue and red plates, with blue flame detail and silver vents, mimicking the truck parts they represent. The shoulders, waist flaps and legs are largely blue, with various flame details throughout. The forearms are red, as is the odd detail, but really Prime has lost much of his iconic G1 colour now, replaced by blue and now silver. The smokestacks are, of course, chromed. There is the odd bit of metallic grey plastic (elbow, shoulder, and knee joint pieces only), but you hardly notice (unlike the Hasbro version which is a patchwork of the stuff). The head is amazingly detailed, and largely silver (as in the film) with a few blue plates (with lighter blue highlights) and pale blue eyes. It is the best movieverse Optimus Prime head sculpt I’ve seen (including ROTF Leader Prime). He is a little on the short-side at 9” (23cm) to the top of his head, he is more than a head shorter than ROTF Leader Prime, who stands 10” (15.5cm) tall. An inch doesn’t sound much, but it makes a massive difference to the bulk of the figure. 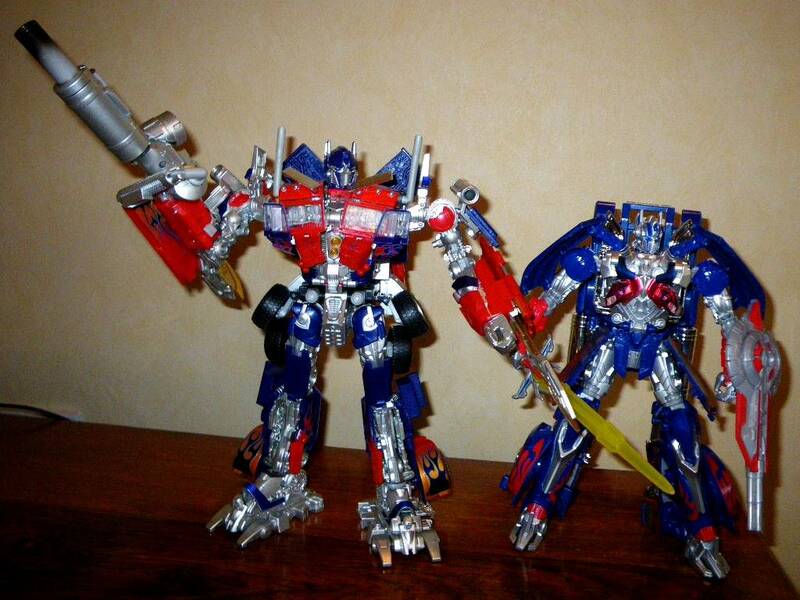 Still, all AoE toys are significantly smaller than their ROTF counterparts, and even their DOTM fellows. Basically, he looks pretty good from the front, but turn him around and that back kibble ruins everything. 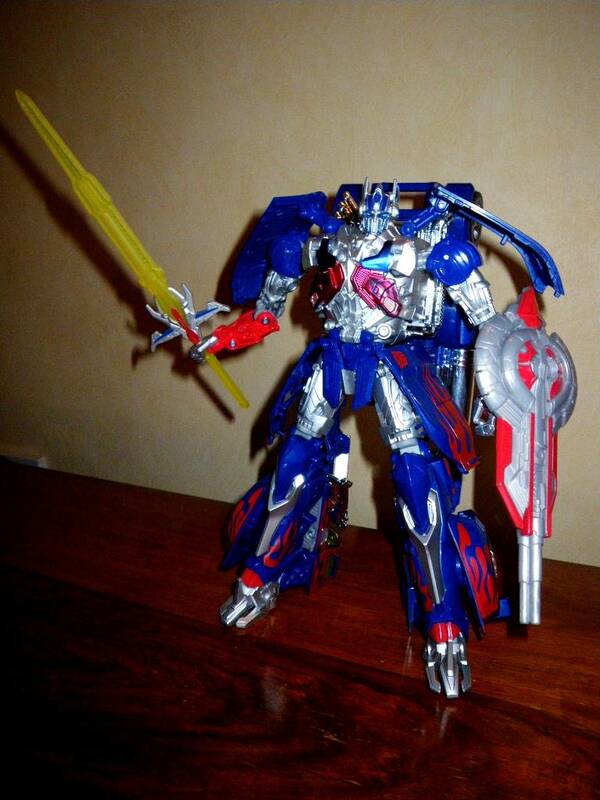 Accessories-wise, Prime comes with the Sword of Judgement and Vector Shield – both of which he does wield in the film. The Sword of Judgement has a very imposing name, but sadly looks rather naff, being moulded in clear yellow plastic. The blade and handle are unpainted, while the hilt is silver with red and blue detailing. The Vector Shield is a weird thing with a triple-barrelled gun on the end, and once again fall short of the glory of the figure itself being cast in dull metallic grey plastic with red detailing. The sword can be stored on Prime’s back, but sadly there doesn’t appear to be a way to attach the shield here, although you’d have thought there would have been capacity to build this in given the huge amount of kibble! So, Prime’s weapons do let him down a bit. The end verdict? Well, let’s face it, this is not the poster boy for Leader Class figures. However, the ease of transformation makes the mould fun to play with. The detailing is phenomenal, while the Takara paint job, while not quite reaching the glory of ROTF Buster Prime, is still absolutely spectacular. If you were going to pick up a version of the mould, I’d strongly urge this one, and to give the awful Hasbro version a wide berth. I guess all of this does beg the question - do we expect too much from Leader Class figures? After ROTF Prime, the answer is almost certainly 'yes', although AoE Generations Leader Prime would be a terrible figure even if you held to low standards. It's only the amazing paint job that pulls Takara's version up a notch. Transformation Design: 2 – I would give this a ‘1’ were it not for the fact the simplicity makes it fun. But I really think little effort went in to this, and it is very lazy. Small tweaks would have made it much better, while a complete rethink would probably have been advisable at an early stage. Durability: 8 – He seems sturdy, and nothing scrapes during transformation. However, I worry about all the chrome parts and metallic paint on top of metallic paint in the long-run. Articulation: 7 – With 16 meaningful points of articulation including the ever-elusive waist joint plus articulated thumbs, Prime is well kitted out for awesome poses. Sadly the weird waist flap engineering and immense back kibble do interfere. Value/Price: 1 – Leader Class figures go for �50 GBP or so, and I managed to import the Takara version (including postage and customs) for the equivalent price. That said, this is not a good Leader Class figure. I’d be disappointed with this mould at any scale above Legends / Legion. The paint job really pleases me, but if I’d bought the Hasbro version I would be royally pissed.